TBILISI, DFWatch–Georgian President Giorgi Margvelashvili Thursday met with his Czech colleague Milos Zeman during a visit to Prague. 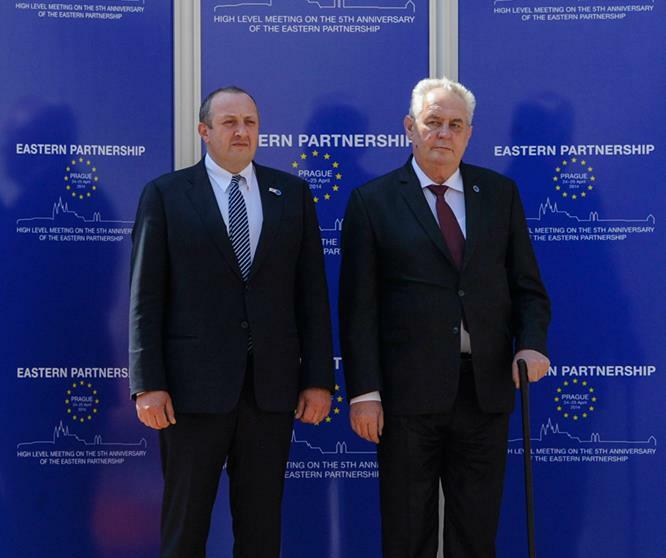 Mergvelashvili came to take part in the five year summit of the Eastern Partnership, a political effort by the EU to reform six former Soviet countries that lie between it and Russia in areas like trade, visa restrictions and rule of law. But first he met his Czech counterpart and the two agreed that relations between Georgia and the Czech Republic should develop in political, economic, education, agriculture and security areas. The two presidents also talked about regional issues, including the situation in Ukraine. EU Commissioner Stefan Fule and President Zeman opened the plenary session of the summit. Margvelashvili talked in his address about the progress Georgia has made in the course of its cooperation with the EU and the importance of signing a so-called association agreement with the Union, which is likely to take place in June. He said this treaty will be a plan for modernizing Georgia. Touching on the crisis in Ukraine, Margvelashvili said the most important thing now is to see a strong, united and stern EU which recognizes the European perspective of certain countries and protects their European future. Margvelashvili also met the presidents of Slovakia, Azerbaijan and Lithuania and the heads of the Swedish, Lithuanian and Armenian delegations. Georgia is the Easter Partnership country which has been most eager to continue the path toward membership and will sign an association agreement with the EU in June along with Moldova. Belarus did not send a delegation to the summit. The other partnership countries are Armenia, Azerbaijan, Moldova, and Ukraine.